The best worlds are often the ones that give you the choice to explore their secrets at your own pace. Where the right path isn't often the most obvious one, but the journey to finding it is satisfying nonetheless. Travelling through the biomechanical realm of Hob: The Definitive Edition, it's easy to lose track of exactly why you're pushing blocks to solve puzzles or using your robotic arm to move between platforms, but that wayward nature rarely feels like a byproduct of fault, rather a conscious desire to embrace a zen-like approach to adventuring. 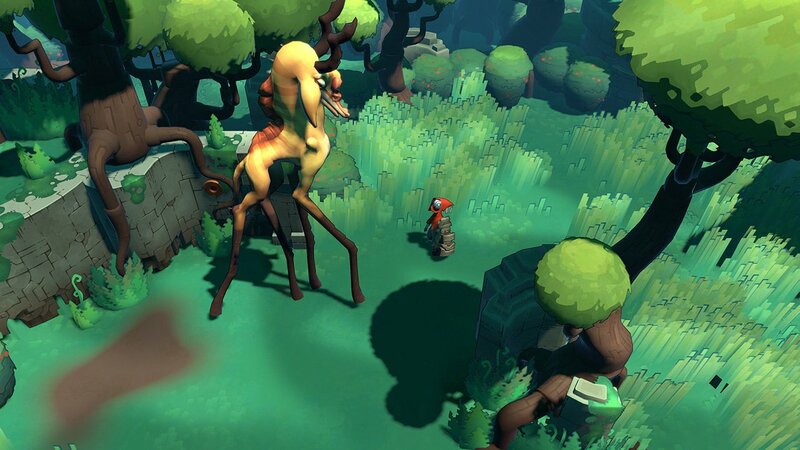 When it first arrived in 2017, Runic Games' sedate mixture of platforming, combat and puzzle solving charmed critics and players alike on PS4 and PC, with a beguiling art style and a subtly presented story reminiscent of Journey. It had its faults - namely a clunky UI and a fixed camera that often made platforming more of a chore than it needed to be - but the solid foundations for a lovely little game were there. So when you learn that Panic Button Games and its golden touch is behind this latest Nintendo Switch port, you're already half-sold on the claim that this really is a 'Definitive Edition' and not some hollow port no one asked for or wants. And Panic Button really has done Runic Games' latest offering justice. This is no foray into buggy and broken territory as we see with the similarly positioned Rime - a game utterly ruined on Switch due to a nearly unplayable port - but rather a faithful update that prioritises performance over presentation while incorporating some quality of life changes that make a considerable difference to a game that was already great in so many ways. But we'll get to those changes shortly. Let's dive into what continues to make Hob a charming platformer good enough to rub shoulder with the likes of Journey and Brothers: A Tale of Two Sons. 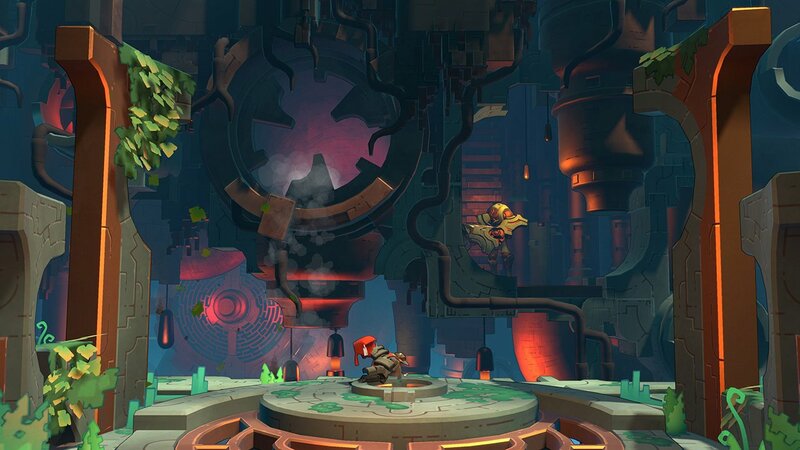 Hob's world is its greatest character, and it's one that keeps revealing sides to itself the further you're willing to delve. There are fields full of swaying long grass, hidden valleys dressed in lichen and an ecosystem of wildlife that roam both above and below. But then you turn a key, blast through a wall or uncover a secret entrance and soon you're seeing the cogs whirring beneath. Entire hills rise and fall to reveal new platforms; pistons turn and depress as you solve puzzles; seemingly immobile ruins shift to reveal long dormant forms of robotic life. TLDR: its Cybertron meets Hyrule. The camera is still fixed, but there are far fewer instances of it getting stuck as you enter a cave, or when a piece of rendered scenery draws too close in the foreground. Now you're free to enjoy the sense of depth Runic has worked so hard to instil. New or high/low-positioned platforms are often kept in view as you discern how to climb up or down to reach a piece of treasure or a doorway to a secret location. Future locales are often teased in the background, with the camera slowly pulling in and out so you can truly appreciate just how intricate Hob's mechanical world truly is. The titular hero suffers an unfortunate encounter with a poisonous goop that’s corrupting the land, so one chop later and our silent protagonist now has a giant mechanical arm fit for purpose. You'll occasionally collect a green currency you can spend back at your home cave on upgrades, but as you progress through the game you’ll also unlock new ways to utilise your metallic appendage. You’ll start off with a powerful punch strong enough to smash buttons and blast through previously impassable walls, but later you’ll unlock the ability to grapple to high ledges or even warp across the map. Each one is perfectly placed, unlocking new paths throughout the world as you go. UI used during gameplay is still minimalist to the point of being almost non-existent (although now you can adjust how much info appears on screen in the options menu), but it’s been completely cleaned up in the menus. With Switch’s touchscreen support, you can now flick between the map, your abilities screen, your inventory and more with ease. It makes navigating the map (which has also been updated to make it a little easier to read) significantly easier, which is a great addition considering how important it is to a game that’s purposefully obtuse with its guidance. Panic Button really has done wonders with Hob. Loading screens, which were previously a little too long in length, have now been noticeably shortened. You can pitch the camera up and down should you want a little more control when jumping between narrow platforms, but we encountered very little issues with the camera’s natural positioning. 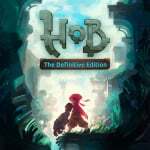 That cel-shaded art style really does make a difference when it comes to balancing out the visual sacrifices, but Hob is still a beautiful little game that retains much of its original appeal. Awesome, stoked to get started! Like April needs another good game. Ugh, I almost miss the Wii U days of waiting for a good game. Now I have to say no to about 3 to 7 games a month as time and money become a factor. I still rather have this problem then game shortages. @Spoony_Tech I couldn't agree more.. so much is going on the wishlist atm. @Spoony_Tech 3 to 7 games... per week! I'm honestly at my limit here! And... well, no complaints really. I feel like this review doesn't do a good job giving me an idea as to how this game plays. It's more about Panic Button than anything else. @Spoony_Tech April is looking nicer by the day, but I think what you're saying there is a biiiiiiiiiit of a exaggeration. We wait plenty. This is a really poor review. It’s really short and doesn’t spend enough time focusing on how the game actually plays. The technical side of things, while certainly important, is not something I necessarily want to be the focus of a review. It’s basically assuming we’ve already played the game. @TimeGuy @BensonUii I didn't even hear about this game until Panic Button announced they were porting it. I look at the screenshots in confusion, trying to figure out what exactly I'm looking at. @BensonUii I get weirded out when reviews of Switch games are more about "it's so amazing this runs on the Switch" versus..."is it actually any good"? Or "sure it runs, but does it actually look good enough that you'd still want this over the CURRENT PC version?" I get this was released a few years ago, but I never heard of it and might like it. I just feel like an 8 deserves more explanation. At the end of the day I don't care who ported it (once it's out), I just care if it plays great and runs great. Just watched some youtube vids and this game looks kind of soft and hazy - the "reviewer" mentions "visual sacrifice" but it's important to know what that exactly means. When I buy games I use reviews in combination with footage, to make purchases on unknowns. Does sacrifice mean not as sharp as the original? Not as many colors? Jagged edges? Did they remove some lighting effects, or shadows for performance issues? Until I own a game I can't trust a lot of videos to give me a realistic look since it's all like double compressed (through a video editor and youtube). SO reviewer comments in tandem with vids are a must. Try a little harder please. @BensonUii I just did and can't tell if youtube compression or the people who edited the vids compressed it a bunch. Cuz it's actually looking a little hazy or soft or whatever in what's currently up on youtube. Why I want a reviewer (with game in hand) to describe what a "visual sacrifice" means. Good game, jeez just do a special « panic button rocks » somewhere and focus on gameplay!!! 2019 no more eShop would ya give us eShop or Physical or Physical Collector's Edition options. @BensonUii It's worth mentioning that Panic Button helped Runic develop the game on PC and PS4. So they are some of the original developers. Somebody is a Marilyn Manson fan! I don't mind the focus on the optimizing quality of Panic Button. This is what sets this version apart from the original release. No need to repeat the same review since they're all available on something called the internet. I think the review has been updated now. @Baart That logic is so flawed. Nintendo fans have never experienced this game, how would all of us know about it? If I didn't click this Review with the intention of learning how the game plays, I wouldn't bother with this website. I come to Nintendolife for their opinions on the game itself. If I have to go to an outside source to learn the basics of the gameplay, the review itself has failed to do its job. @MeloMan Didn't NL get a few "sit down" interviews with them last year? Maybe they wanna seem chummy and used this review as an opportunity to give them a beej? Seriously, what a waste of time reading this Panic Button fan article. @Baart Awful logic. It’s only acceptable if there is already a review posted on this site, but there isn’t. @TimeGuy Yeah, you really show how you're the one who needs to teach others about logic. Lol. @AlternateButtons nah you're just too lazy to click once more to get to another free site where you can read reviews and whine. Bought it just before it released today to get the discount. Never heard of this before couple days ago and was sold once I saw it also reviewed well. Should be done downloading by now too. Absolutely love this game, for those wondering how it plays, i'd say it has similarities to 2D Zelda, just with a lot less emphasis on combat and instead of dungeons (although there are some) the main world itself is the puzzle. 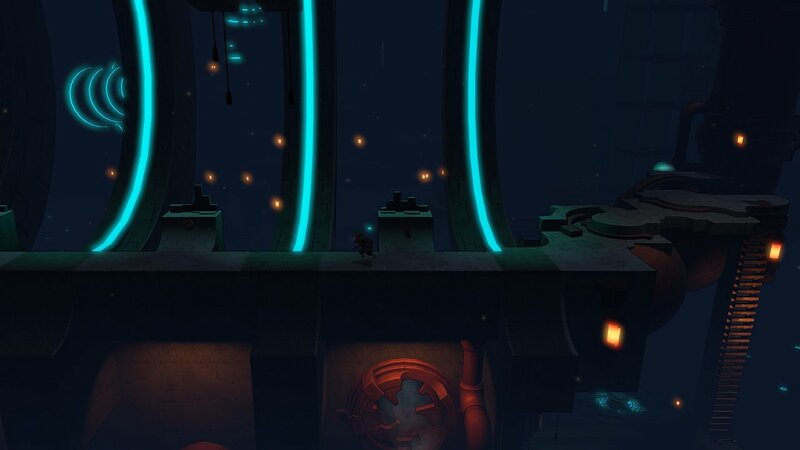 Unlocking it little by little is how you progress through the game, mainly through environmental puzzles but sometimes by some light platforming sections. I highly recommend the game to anyone on the fence, i thoroughly enjoyed it from start to finish, it has a really unique atmosphere to it. @Toadie your feedback was more helpfull than the review... kudos for you !! Yesssss. I am always looking for new, and unique platforming adventure games to add to my collection. I am always trying to broaden my horizons on gaming, and this looks to be another exciting entry into my game playing story. I will be getting this one. I am currently delving deeply into Portal Knights though. @Toadie I agree, thank you for your post, I will get the game! ok I'm confused....I just read another review where they said the game is plagued with framerate issues and technical problems on the switch???? @Toadie Did you play it on Switch and did you notice any significant technical problems or framerate issues? @AlternateButtons I didn't learn a thing other than the main character chopping off his arm and replacing with a metal one. @Toadie Thank you. Your comment was more helpful than this article. Good to hear, I gave up on the game because it ran so poorly on PS4 and I don’t know if it was ever completely fixed. I may give it another go. RiME was not unplayable. It was actually a great game with some minor instances of hiccups that didn’t detract from the overall experience of the game. When I first saw the video of this Hob I got a huge RiME impression and for that I will eventually try this game out. Like others I’d never heard of this game before since I’ve mainly owned Nintendo consoles so a better review would have been nice. After reading this I’m still left wondering what this game is really like. It’s Zelda meets Prince of Persia. Clever puzzles with satisfying jumping action and challenging combat (you’re an easy target if you don’t dodge and seek for an opening). The visuals are surprisingly good, even with the downgrade. Two hours in and I’m still in love. The resolution takes a serious hit in handheld mode. Quite jarring, actually. It goes from being one of the prettiest games on Switch in docked mode to one of the crudest in handheld. Doesn't really impact gameplay once you get over it, and I mostly play docked anyway. But sticklers will want to think twice. I would love it if NL made this kind of info standard in their Switch reviews. Especially as the vast games library grows ever more vast by the day, we depend on you for consumer advice. In the review above, you mention touchscreen support, so you either played in handheld mode and didn't think it necessary to reveal the dramatic drop in visual quality, or you didn't actually play it in handheld but are instead reading off a list of features provided in the press release. @nofriendo totally agree. There are a few reviews from small Nintendo review sites that mention the drop in visuals when in handheld mode and also frame rate issues. It's a shame such a trusted website failed in this review to highlight anything other then the superficial. I will give it a few more days before purchasing for some more reviews that provide more clarity. @baller98 thanks mate, I actually saw it earlier. Think I might skip it and just buy Celeste finally as still on sale. Also have octopath traveller unplayed ... And xenoblade too ! Ouch, it ran like crap on PS4, I couldn’t finish it because of the problem. And here I thought Panic Button did what Runic didn’t...make it run well. @Kang81 Yeah I am very curious how the Switch version runs. Been waiting to hear about that because I have been wanting this game for a hot minute. I had no idea how bad the PS4 version ran until I saw your comment. Some searching around says it is a memory leak so quitting and restarting every now and again helps alleviate some of the problem. Any chance you know what patch the game is on? Several people on Reddit seem say that the game is running much more fluidly in version 1.1. Playing the game and totally enjoying it handheld. Forget about the FPS. If you want it hook it to dockmode for better graphics. I’d have to check, I’ll try and remember to do so after work today. Enjoying this game a lot. Beautiful to play and beautiful to look at.